The following conversation are real, and the names are real. Karl is a fellow CFPA red-liner – that is, a CT400 Completist, who actually just DID complete his CT400 challenge in November 2014. Karl is awesome. I relayed this conversation to my dad while having lunch along a pristine cascade in the Tunxis State Forest, somewhere in the wilds of Barkhamsted. That’s what happens when you hike with a nearly 71-year-old man. Things get serious. 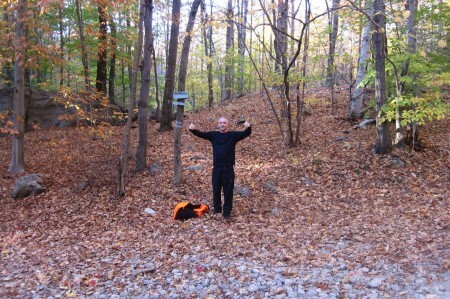 But finishing up the longest trail in Connecticut on an absolutely perfect October day allowed me many hours of internal thought. I loved it all. I started out in February 2008 and finished in October 2013. Five and a half years. I had a child in the middle of it and got the difficult diagnosis for my eldest son just after starting. My dad survived cancer. I changed jobs. Kemba Walker won a national championship. Shabazz Napier was about to embark on his. All through it, the Tunxis remained there for me to complete. But for some reason, completing the Tunxis, and all it’s crazy nonsensical fits and spurts in the southern sections, made me reflect more on this journey than most of the others along the way. Was it because I did the last 21 miles with my dad? Or because it is the longest trail in the state? 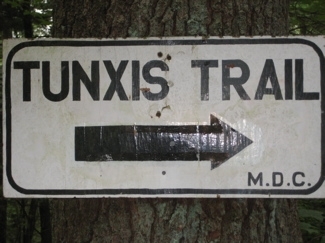 Certainly a combination of the two – plus the fact that “completing” the Tunxis requires a lot of patience and, let’s face it, a few rather absurd trails in Wolcott and Bristol and Burlington. But to me, those weird loops and random spurs in those southern regions of the Tunxis is what makes it so unique. 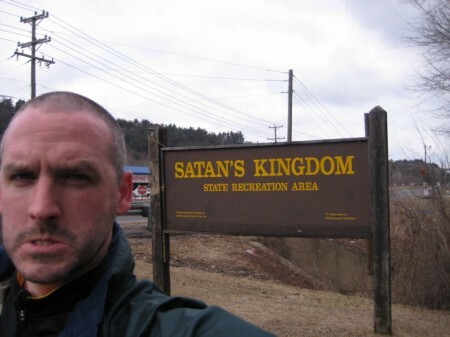 But man, once to route 44 and Satan’s Kingdom, the final miles north to the Massachusetts border are just fantastic. Rugged, remote and beautiful, completing the Tunis north region gives one a sense of solitude not easy to find in our compact state. 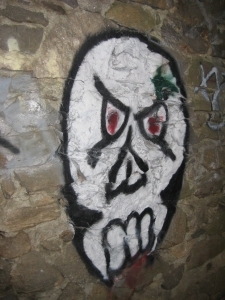 A friend of mine just asked me today if there was anything “worthwhile” north of the Indian Council Caves on the Tunxis. (This inquiry spurred me to finish writing up my trail experience.) I told him that aside from a great view from Pine Mountain in Hartland, not really. Except that I loved the 10 or so miles north of the caves. Simply because they are remote and quiet and beautiful. I’m not sure I convinced anyone to go hike those ten miles though… and that’s fine. For those of us that do, especially in autumn, will continue to appreciate the fact that most of you won’t.